AUSTIN, Texas — Under the Trump administration the relationship between the Republican Party and Latinos is strained, at best. This moment could well be the end of the GOP having any minority membership. Or the party could reach a breaking point that leads it to moderate and pursue a big tent strategy. The ball is in the GOP’s court. It is up to the Republican Party as to which path to take. More specifically it’s up to Latino Republicans and even more specifically, it’s up to Marco Rubio—one of the stars of the GOP and who has 2020/2024 aspirations. The response by President Trump in the aftermath of Charlottesville has uncovered a nativist and xenophobic position by the White House that can’t be defended. It’s up to someone like Senator Rubio to demonstrate that the GOP has room for people like him-- non-white, non-Anglo-Saxon Protestants. President Trump has never been shy about his anti-immigrant stances, heck, he launched his campaign bashing Mexican immigrants and Mexican Americans. Remember his attack of Judge Curiel? And he still wants to build the wall. Up until Charlottesville the President had couched his anti-immigrant positions around the economy—keeping immigrants from stealing American jobs—and crime—keeping immigrants from committing crimes. A big chunk of Americans, especially those in swing states, liked Trump’s message and cast their vote for him. Among Latinos roughly one in five voted for him. Trump’s talk on immigration didn’t turn away all Hispanics because his brand of economic populism and get-tough bravado resonated with some Latinos just as with non-minority voters. Also, the issue of immigration is not the top issue of concern for all Hispanics. Latinos who are further removed from their immigration experience are less likely to feel mobilized by the issue. But the President’s discourse in the aftermath of Charlottesville unearthed a blatant nativist link to this nation’s Republican President. It has become abundantly clear that it goes deeper than restricting immigration for the sake of jobs or public safety; now it’s about preserving a certain kind of white-centered society. Neo Nazis aren’t much into detail. They don’t differentiate between Latinos and other minorities. Nativists are equal opportunity in not liking blacks, Jews, Hispanics, Muslims, and the list goes on. Republican Party leaders know as much. So far most congressional and party leaders have denounced President Trump for fueling the racist stances of nativists. This outcry is a good first step but talk is cheap. The question is what happens once this episode cools down and other new events dominate the news cycle. 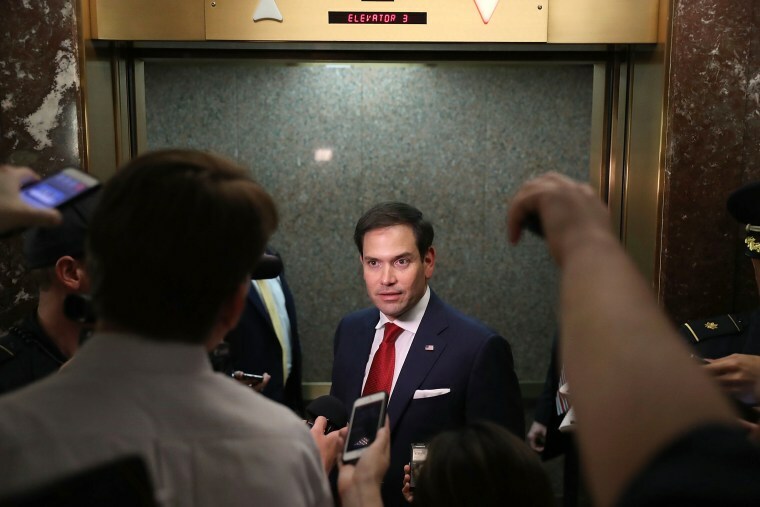 RELATED: Opinion: Where Are You, Senator Rubio? The Republican Party needs to get into action, meaning they need to craft and pass legislation. They need to demonstrate that its policies are for the benefit of all Americans. Turning to race and hateful rhetoric is easy when there aren’t substantive policies to turn to. The inability of Republicans to provide a better alternative to Obamacare, comprehensive immigration reform and tax policy are just a few examples. In the absence of delivering on bread and butter issues, folks like President Trump fill in the void with scapegoating tactics. Today, the GOP is at a crossroads. Does the Republican Party become a party dominated by race and white nationalism? Moving the Republican Party away from white nationalists will be a group lift. However, a clear leader is necessary to put a face to the name of maintaining a big tent GOP. So far Rubio has been one of the strongest critics of President Trump’s reaction (or lack there of) to white nationalism. Marco Rubio also has the best résumé for the job. Not only is Marco Rubio, a minority himself, he is a poster child for core Republican issues-fiscal conservative, foreign policy hawk, as well as a social conservative. He also had a decent run in the 2016 Republican Presidential primary. Finally, Rubio is smart and ambitious and knows that if he can turn this GOP ship around, he may one day sit where Donald Trump sits now.